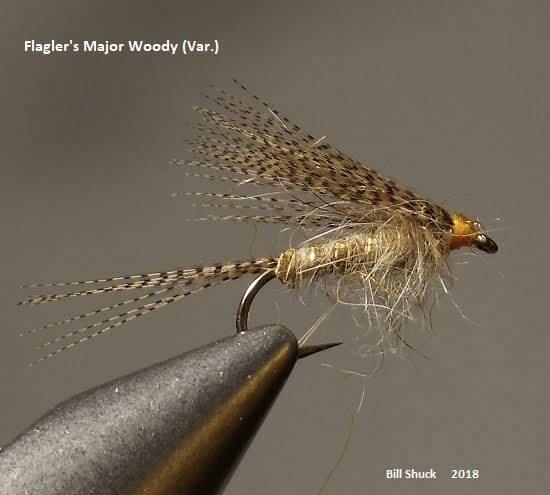 Bill Shuck sent me this photo of a Major Woody he tied after seeing the video by Tim Flagler. He used materials he had on hand, but as he says in his email, "I think it'll fish." I agree, nice tie. Like it...has some attributes that speak brook trout. A very nice fly (and name) along with the video. The pattern bears a striking resemblance to "The Remerger" by van Klinken. Take a look when you have a moment. Many flies resemble "The Remerger" in construction and proportion, including some that are even older. The distinguishing feature of the "Major Woody" is that all of the materials used to tie it either are or look like wood duck.